Click on the images for a full view. Can you name anyone in the photos? Many thanks to Moira Frize for the above picture and the following explanation: My father Charlie Frize was the foreman steel fixer working on the new Howford Bridge. We lived in a caravan in the grounds of Catrine House nurseries. The caravan was unusual in that it was a single decker bus which my father had converted. It was painted blue and cream. 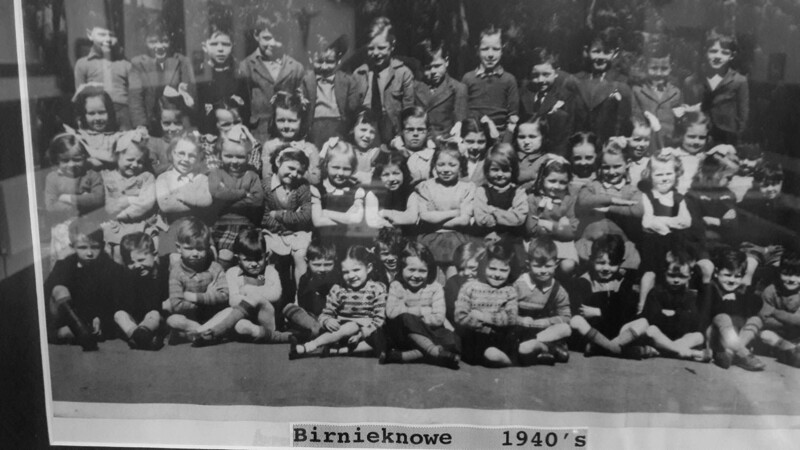 My brother and I went to St. Patricks at Birnieknowe and were picked up every day by minibus. I have attached a photo of primary 1 with Miss McAtee. My brother is Charlie Frize second row from the back 4th from left next to the little altar. I wonder if anyone else from the photo knows other names. 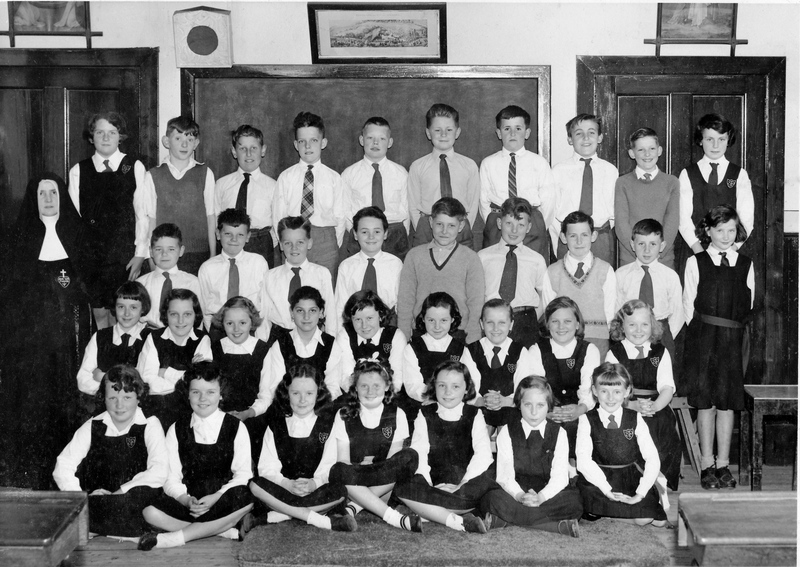 This is a picture I got from Sam Tomlin of the Birnieknowe school communion with his wife Greta on the right, 3 rows down. I had been asking Greta if she had any school photos for my collection because all the photos so far are of Catrine school but I haven't ever yet found any Roman Catholic entries from anyone. There must be a whole lot of school photos of Catrine Catholic families out there so here's hoping I manage to get some soon. 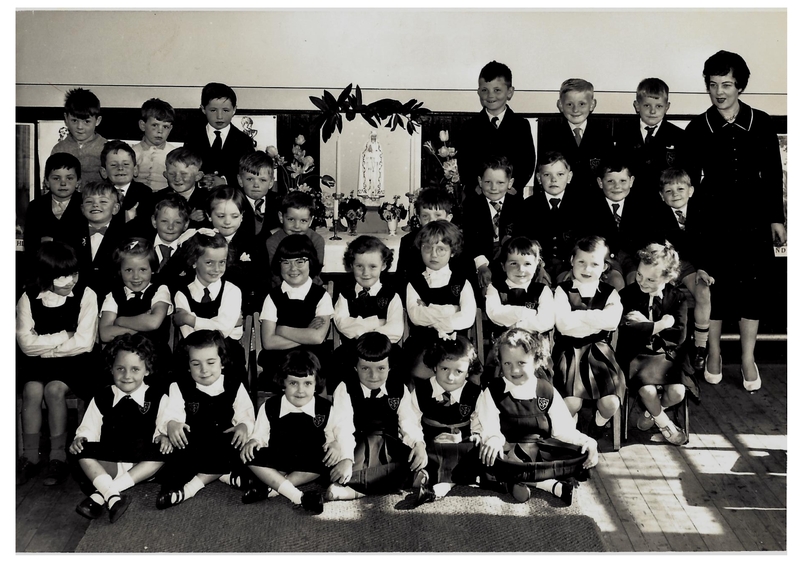 Leo Melaugh kindly donated this school photo from the Birnieknowe, St Patricks' Roman Catholic School, between Auchinleck and Logan, where all the local Catholic children of our generation went for their Primary education. I have named the only ones I can recognise for now although the spelling will be all wrong. Left to Right Top row: ?,?,?,?,Yanic MisKoskie,?,James Docherty,?,?,?.Second row from the top: ?,?,?,?,?,?,?,?,Leo Melaugh,?. Third row: ?,?,?,?,?,?,?,?,?. Front row: ?,?,?,?,?,?,Elizabeth McCluskie. Many thanks for now Leo. Sorry I wasn't home when you arrived with the picture. This picture was sent to me by Mark Vano. He got it from a house clearance in the east end of London. On the back of the photo it says Robert McCarroll 44 Heathfield Road Auchinleck Ayrshire Scotland. Mark's daughter has sent me this copy of the print. Many thanks to Elaine Stakim who has shared this image I put on Facebook with the people of Auchinleck we have now found Robert McCarroll's grandson Kevin Moran and he has confirmed that his grandfather is in the picture. His mother is still alive and she has also confirmed that her father is in the photo. This is a new scan of the above picture. 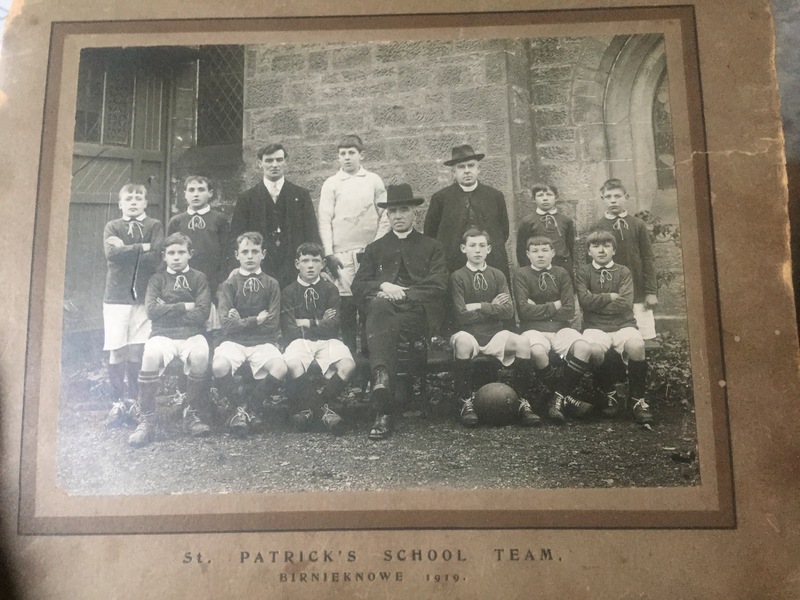 Just had word via my guest book from Sean Devlin in America now to say that his grandfather John Devlin is the goal keeper in the back row in the middle of the picture, dressed in white. John's younger brother Bob Devlin lived to nearly a hundred and Sean's cousin got this information from him about the photo back in 2005. The sitting priest is Father Vignoles. He came to St. Patrick's from Kilmarnock. Bob spoke very kindly of him. He was still at St. Patrick's when the family came to the U.S. (note – family came to the US in 1926/1927). The standing priest is Father Letters. He was English. The man standing behind the team is Daniel Gilroy. He was a teacher at the school. 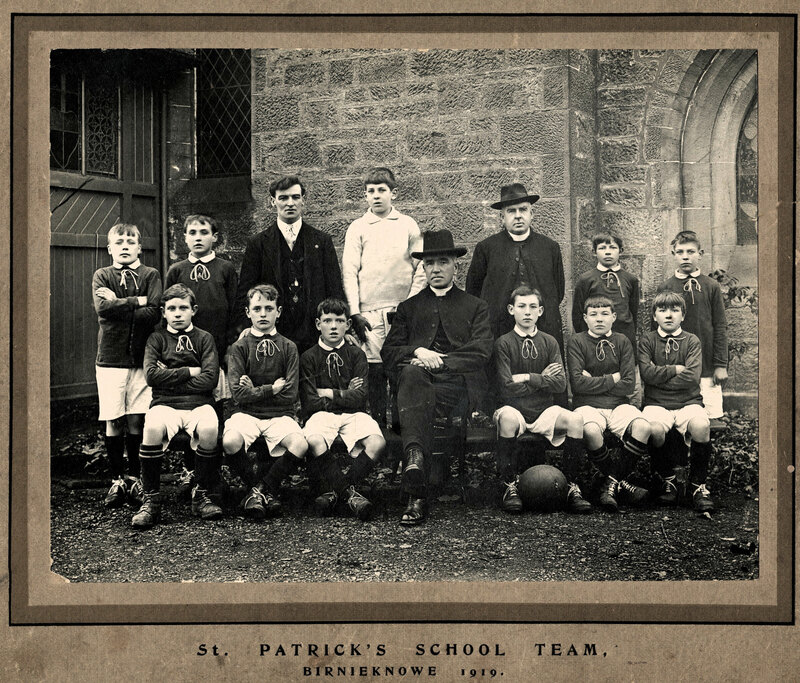 The only player, other than John Devlin (goalkeeper), that he could name was one sitting next to the sitting priest. He is Edward Scanlan . Bob thought he became a priest. 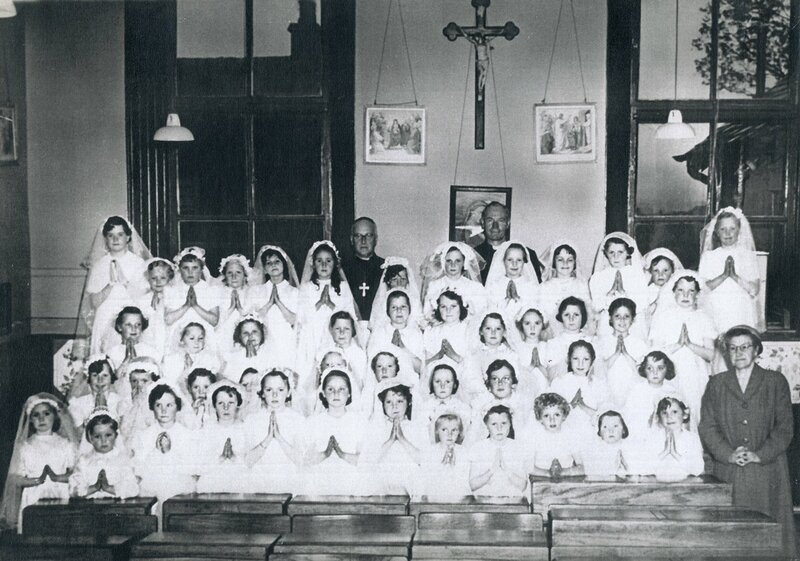 Unfortunately, I’m not sure which of the two boys sitting next to Father Vignoles is Edward Scanlon because the cousin couldn’t recall which boy my great uncle Bob pointed out. So many thanks to Sean for sending me this information. I also have word from Kevin Moran that his grandfather Robert McCarroll is standing next to Father Letter second from the right as you look at the picture. 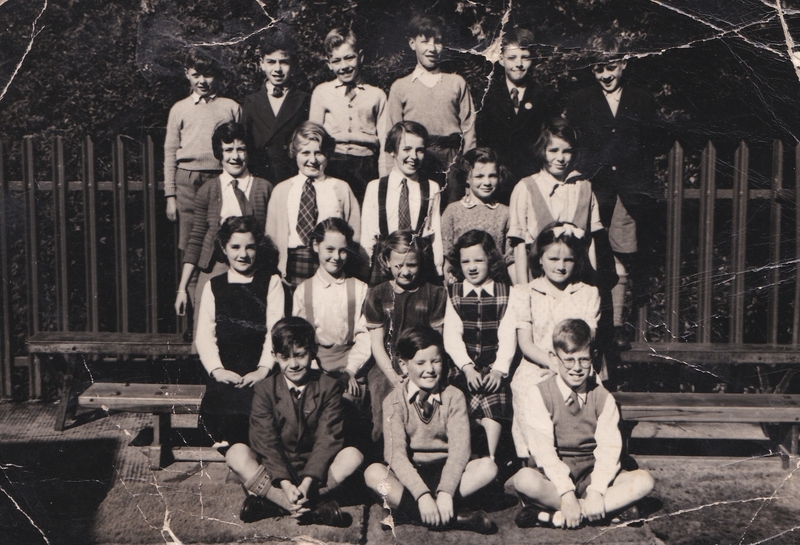 So we now have: Back row left to right: ?, ?, Teacher Daniel Gilroy, John Devlin, Father Letters, Robert McCarroll, ?. Front row left to right: ?, ?, Edward Scanlan? Father Vignoles, Edward Scanlan?, ?, ?. Many thanks to Lawrence McCann for the next two photos. The above has his brother Tommy and his sister Marion in it. Another from Lawrence McCann. He says he is on the back row second in from the right. Third in is John Magary. Next row second from the right is Marnene McCall his cousin. Third row has Isobel Dignome and the front row has Charles Harkness.